One of the most exciting times of the year is opening day in Major League Baseball and we are only a few days away. 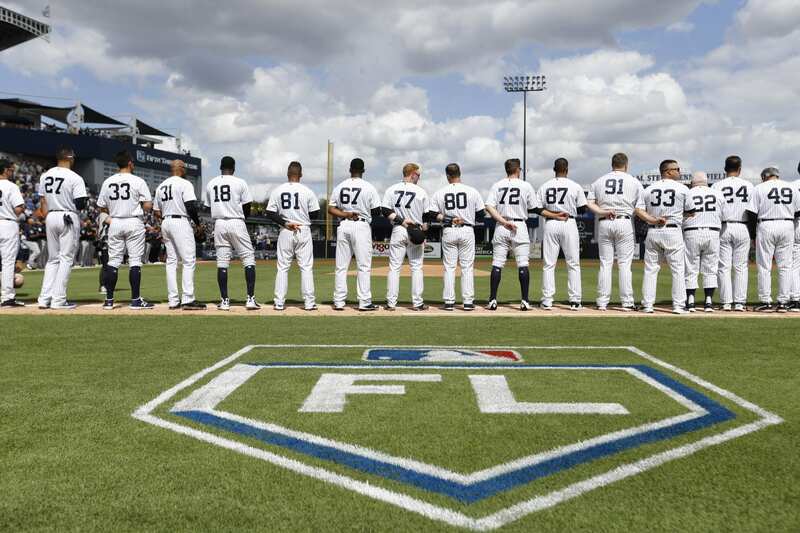 The New York Yankees looked primed and ready to go after falling one game short of the World Series and the New York Mets look to rebound from a dreadful season. It is also the time of year to roll out predictions that will most likely be way off, but it is fun nonetheless. So here it is… My MLB 2018 season predictions! No Surprise here. The New York Yankees added the reigning National League MVP to an already stacked lineup. The starting pitching will be the biggest concern this season with Yankees. Severino and Gray should be solid but you always have concerns with Tanaka’s health and Sabathia’s age. If they hold up then the Yankees have 100 win potential. Should be a fun summer in the Bronx. The Boston Red Sox will make things interesting and compete all season but will fall short however, they will secure a wild card spot. We can simply pencil in the Cleveland Indians for an AL Central title. The Minnesota Twins did get better in the off season by adding Lance Lynn and Logan Morrison and although that will not be enough to overtake the Indians, it will be enough to earn a chance in the wild card game. The other three teams in the division will be battling for last place the entire season which will result with the Indians running away with this division early. This will be another easy division title for the Houston Astros. Many teams who come off of a World Series championship may come out to start the season a little sluggish. I just do not see that happening with the Houston Astros. They are a scrappy, hard nosed team who still sound very hungry, especially starting pitcher Dallas Keuchel. We’re not the Cubs,” Keuchel told The Washington Post when asked about the Chicago Cubs’ returning almost the same team from their 2016 championship and winning 11 fewer games. “I firmly believe we have better players.” The Angels did improve in the offseason by adding Zack Cosart and the two way Japanese superstar Shohei Ohtani but that will not be enough. The Washington Nationals did not do much in the offseason but to be fair, they really didn’t need to. They added Matt Adams which will give them a little more pop in their lineup from time to time but that’s about it. They still should reign supreme in the NL East with another division title. The New York Mets will rebound from a horrendous year last year and they should contend for the division but will ultimately fall short. They will however earn a spot in the Wild Card playoff game. This will be a very interesting year in the National league Central. I still see the Chicago Cubs taking home the division title but it will not be easy. The Brewers are a team on the rise and will push the Cubs this season. I envision the Cubs pulling away in September after a back and forth summer. The St. Louis Cardinals will compete as always but they do not have the pitching quality they had in years past. This will be the most exciting division to keep an eye on this season. You have four legitimate teams that will make a push for the playoffs this year. I still think the Dodgers are the cream of the crop and will win the division but the other teams are getting closer. The Rockies will surpass the Diamondbacks this year and grab and NL Wild card spot. I would have the Giants a bit higher if it were not for the injury to Madison Bumgarner. Losing two months of the season will put them in a tough spot because they lack depth at starting pitching. Only from one of our best writers!